Some of these vendors provide anti virus or anti spam only. Others allow the implementation of a complex rule set for data loss prevention. Most software solutions retrieve and submit the emails based on the SMTP protocol. If a customer needs to scan emails between mailboxes of the internal messaging system, then a plugin to the mail system is needed. The plugin retrieves the email or its contents before passing it to the target mailbox. 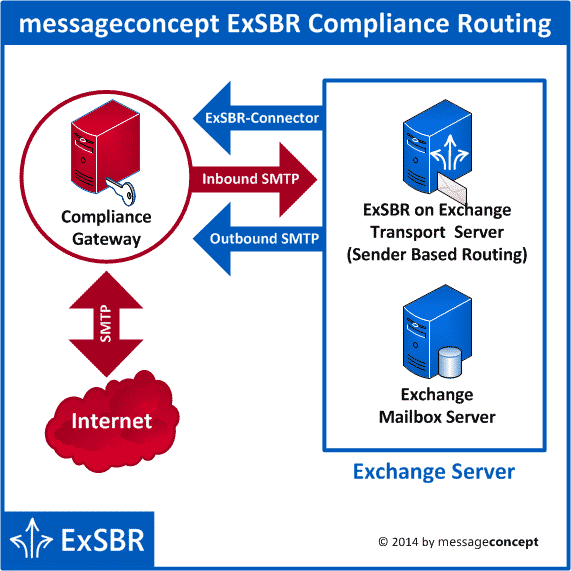 Our routing agent messageconcept ExSBR is a vendor-neutral solution to force internal mails between Exchange Server mailboxes to an external SMTP gateway. The agent is able to force all messages to the compliance solution or can even select the emails based on sender’s properties. Our software overwrites Exchange Server’s routing decision and forces Exchange to reroute the emails. Exchange will force the message to a specific send connector and, as a result, to the secure email gateway. This solution is used by many enterprise customers worldwide. Banks avoid the slip of insider information. Industrial companies prevent to get in conflict with contract worker legislation. Two tenants, sharing one Exchange Organization, scan emails between their companies. Contact us to get more information on how messageconcept ExSBR works in your compliance scenario.